There was nary a seat to be found in the Alice Silverman Theater as the Newport Symphony and Porthole Players collaborated last weekend to bring a true winter wonder to the Newport Performing Arts Center. Rhodd Caldwell opened with a bright and heartfelt reading of Dylan Thomas’ short story, A Child’s Christmas in Wales. Backed with lovely, old-fashioned images by award-winning illustrator Trina Schart Hyman, one could almost hear snowballs whizzing past our ears and smell the holiday cooking being described in Rhodd's narration. The second half related a heartwarming seasonal tale by Gian Carlo Menotti, his opera in one act, Amahl and the Night Visitors. Young Braylon Belloni sang the role of Amahl, bringing pathos and concern for the poor shepherd boy and his mother, who was poignantly sung by Gidget Manucci Ashley. 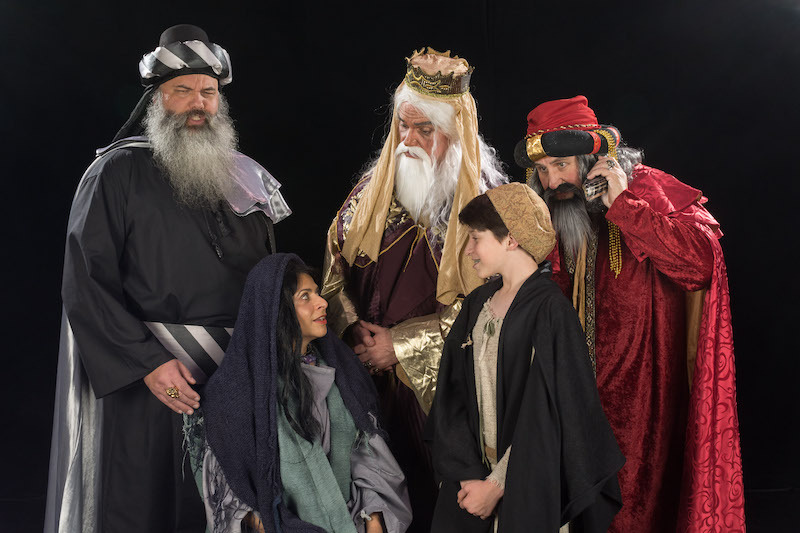 Three kings, played with dignity by Gary Herd, Pete Theodore, and Brian Haggerty, visited Amahl’s home in their journey east tracking a star that would lead them to find a newborn child. The music was part of the storytelling, infusing life and spirit throughout the production. Newport’s own Carlyn Jefferson appeared to play piano non-stop while oboes performed by NSO musicians Pablo Izquierdo and Kris Klavik supported the shepherd’s story. NSO musician Brad Capshaw conducted the ensemble, occupying a position at upstage center to surveil the actors and blend the music with the action. Peasant dancers, choreographed by Nancy Mittleman, brought a sweet and delightful joyousness, even playfulness, to an audience with the kings. Shepherds and shepherdesses filled the stage with joy and activity. This production was directed by Bonnie Ross and produced by Rhodd Caldwell.